Capitalist Russia has interests in Ukraine — only predatory, imperialist interests. The slogans of «the brotherhood of peoples» and «protection against fascism» are just beautiful words, fig leaf to disguise the true purpose — to robbery, exploitation of the proletariat in Ukraine, neo-colonial, expanding their market. We are against «OUR» Russian bourgeoisie and against the ALL world bourgeoisie. 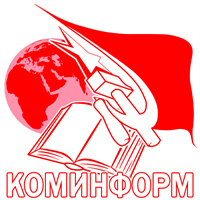 We are not followers of the social-chauvinists — mensheviks, the personages of the Second International, renegade Kautsky, Zyuganov (leader of the Party CPRF — КПРФ), Simonenko (leader of the Party KPU — КПУ) and the other chauvinists — who are the traitors of communist cause. We are against Ukrainian fascists and imperialists. But we do not support the Russian imperialists too. Workers of the Russian Federation and Ukraine have not the interests in this military conflict. THIS IS AN IMPERIALIST CONFLICT. THE PROLETARIAT MUST NOT PARTICIPATE. Caricature of a soviet artist A.Deni: «Leaders of the right-wing social democracy help bourgeoisie in the mobilization of workers for the war».